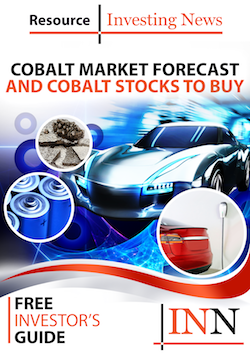 What are the top cobalt stocks of 2019? These TSXV-listed cobalt companies have all seen year-to-date share price increases. While the decline in cobalt prices continued during the first quarter of 2019, demand for the battery metal is still expected to surge in the coming years, driven by electric vehicle (EV) uptake. As the EV revolution continues to expand, demand for key battery metals like lithium, graphite and cobalt is expected to continue following suit accordingly. Below we run through the three top cobalt stocks on the TSXV by share price performance. All year-to-date and share price information was obtained on April 10, 2019, from TradingView’s stock screener, and all companies listed had market caps above C$10 million at that time. Cobalt 27 Capital is a Toronto-based company that offers pure-play exposure to cobalt and other key EV battery metals. The company owns physical cobalt and has acquired a cobalt stream on Vale’s (NYSE:VALE) Voisey’s Bay mine‎ beginning in 2021. On January 2, the company announced the friendly acquisition of Highlands Pacific (ASX:HIG) to create a diversified battery metals streaming company, increasing its exposure to cobalt and nickel production from the Ramu mine. During the first three months of the year, Cobalt 27 Capital also acquired royalties on the producing Mount Marion lithium mine, the Flemington nickel-cobalt project and the Nyngan scandium project in Australia. Focused on exploring and developing strategic battery metals projects and striving to be a leader in the sector, BlueBird Battery Metals has a particular scope on copper, cobalt, nickel and vanadium. The company has two primary assets: its Canegrass project and its Ashburton project, both of which are located in Western Australia. First Cobalt is a vertically integrated cobalt exploration and development company with three significant assets located in Idaho, US, and Ontario, Canada. The company is focused on developing a supply of battery-grade cobalt in North America for the rapidly growing EV market. First Cobalt’s Iron Creek project, which covers 727 hectares in the Idaho Cobalt Belt, is one of the few cobalt projects in the US potentially nearing production over the next five years. On April 3, the company announced that it had successfully produced battery-grade cobalt sulfate at its refinery in Ontario. First Cobalt is looking to restart the idled refinery within two years, and is in talks to supply the battery-grade product to four leading automakers, CEO Trent Mell told Reuters on April 10. Editorial Disclosure: First Cobalt is a client of the Investing News Network. This article is not paid-for content. You have missed ECobalt Solutions. Check their website and you will see the potential of this company.